Eight passengers removed from airplane on route to Uman after disorderly, drunken conduct. Flight delayed by three hours. 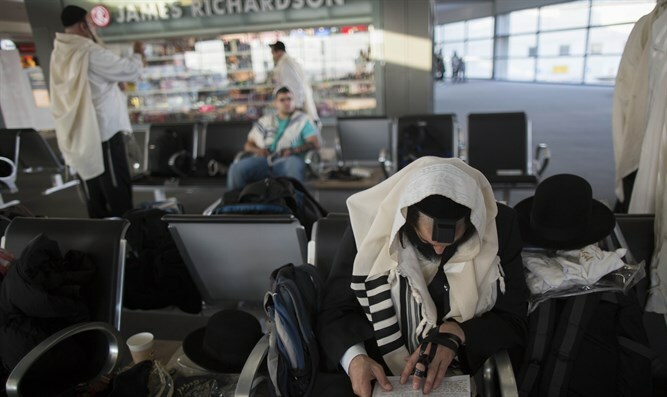 Eight passengers were taken off a plane yesterday at Ben-Gurion Airport on their way to Uman after disorderly conduct while some of them were even caught drunk. The flight was delayed for three hours. According to a Ynet report, some passengers who were detained clashed with security forces, cursed, and violated public order. "Every year there are many incidents with passengers going to Uman. There are passengers who come drunk and even drugged onto the airplane, some come with plastic bags instead of suitcases. Many arrive without tickets, asking for 'handouts' from other passengers, and quite a few of them arrive at the flight at the last minute as if it were a bus," a senior official at Ben-Gurion Airport was quoted as saying. The Breslov Hasidism expressed deep resentment at passengers who besmirch the group's name and the tens of thousands of worshipers traveling for Rosh Hashana. "Besides that it's an incalculable desecration of G-d's name, Chassidim don't behave this way," they said.